A review of Writing, Authority and Practice in Tokugawa Medicine, 1650-1850, by Daniel Trambaiolo. Scholars interested in the history of medicine in early modern Japan are faced with a broad range of works, which tackle the subject from different angles yet taking similar approaches that in majority focus on the development of medical ideas and practices from Europe. In his study Trambaiolo seeks to challenge this approach. Instead of stressing the growing role of Western medicine as the majority of Western scholarship does, he aims at developing a more balanced view of the history of medical knowledge in Tokugawa Japan by giving older traditions equal attention and including the broader medical environment of East Asia (pp. 3-4). By mostly drawing on primary sources ranging from medical treatises to written accounts of famous doctors, and a broad range of secondary literature in Japanese, Trambaiolo depicts the interrelationship between texts, social institutions and clinical practices in order to show how medical knowledge from China, Korea and Europe were absorbed and integrated into Japan’s medical cultures. He seeks to show the co-existence of competing medical doctrines in Tokugawa Japan by basing his study on the approach of Lorraine Daston and Peter Galison who stress the co-existence of contrasting ways of knowing (Lorraine Daston and Peter Galison, Objectivity. New York: Zone Books, 2007) – in contrast to Thomas Kuhn’s or Michel Foucault’s theoretical models which emphasise their mutual incompatibility (Thomas S. Kuhn, The Structure of Scientific Revolutions. Chicago: University of Chicago Press, 1962; Michel Foucault, The Order of Things: An Archaeology of the Human Sciences. London: Routledge, 2002) (p. 5). Analogous to the title keywords of Writing, Authority and Practice, the study is divided into three parts. Part 1 focuses on the language of medical texts and philology in which medical knowledge is embedded. Therein, Trambaiolo follows Tsukamoto Manabu’s suggestion that assumes two flows of medical knowledge – one from the elite scholars and doctors from the centre to the people of the peripheries, and vice versa (Tsukamoto Manabu, Tokai to inaka: Nihon bunka gaishi. Heibonsha, 1991) – in order to illustrate how multiple forms of written medical language shaped both intellectual and social dimensions (p. 26). 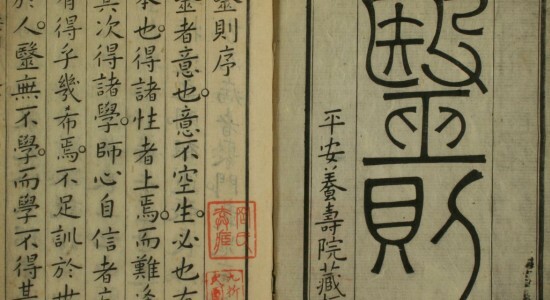 By giving text examples he depicts the process of vernacularisation of classical medicine represented by kanbun literature into kana texts on the one hand, and the recording and dissemination of local medical knowledge for the general readership on the other, and concludes that the development of local and cosmopolitan forms of technical discourse should be regarded as complementary processes rather than as competing alternatives (p. 52). By further instancing two prominent Ancient Formulas (kohō 古方) doctors of the eighteenth century, Yamawaki Tōyō (1705-62) and Yoshimasu Tōdō (1702-73), he shows how a new style of medical epistemology and social identity developed based on Ogyū Sorai’s (1666-1728) philological and philosophical methods (p. 55). Although their medical investigations did not depend on Sorai’s doctrines, there exists a structural parallel between these two poles in which experience plays a key role in both philology and medicine, thus revealing that medical ideas and practices depend on the social environment in which they are developed. (pp. 101-102). Part 2 deals with the transmission of knowledge in the global and local context through the channels of personal contacts. By analysing the medical content of the dialogues between the members of the Korean embassies and the Japanese representatives – known as brush talks – between the years 1607 and 1811, Trambaiolo shows how these interactions shaped the ways practitioners interpreted medical writings and put their medical learning into practice (p. 104). Unlike some historians he questions a successful interaction between these two parties, not because of differences in ethnicity, but because of cultural, social and institutional conditions that impeded effective communication. The status of a Confucian and a physician in Korea, for example, differed from that of a doctor in Japan, and therefore made successful interactions difficult to achieve. Within Japan, however, acceptance and transmission of medical ideas and practices were much more successful and went accompanied by lineage authority (p. 143). Instancing the Ikeda doctors specialised in smallpox vaccination who claimed that their authority derived from their possession of certain secret techniques, Trambaiolo depicts the gradual transition from secret to public modes of transmission without suffering loss of authority. He does this by examining the modes through which they build and maintained their authority within the medical world (pp. 144-5). Supportive conditions in this process were, for example, the Bakufu’s believe that specialisation could allow doctors to treat their patients more effectively, and the growth of the printing industry that transformed the ways medical knowledge was disseminated in society and induced doctors to reflect and change their modes of teaching and practicing (p. 176). Part 3 builds on the process of transition in regard to therapy. It deals with the adoption of new medical techniques and drugs by drawing on traditional patterns of assimilation. Rather than investigating the activities of ranpō (Western medicine) practitioners, Trambaiolo directs his attention towards older forms of medical knowledge that could equally serve as sources of innovation: vomiting, bloodletting, and the use of mercurial drugs. Although quite diverse in their historical origins, these aggressive therapies were often used by doctors who were influenced by the ideas of Ancient Formulas medicines, and applied to diseases difficult to treat, such as syphilis (pp. 180-181). Trambaiolo’s analysis of their methods reveals that the determining factor in the acceptance of a new technique was not its Chinese or European origins, but rather the personal experiences of doctors and their patients. This finding is then corroborated by a case study of the introduction of smallpox vaccination, revealing that “the acceptance of the new technique depended on the same processes of negotiation, persuasion, diffusion through social networks, and gradual accumulation of practical experience within Japan” and was not successful because of its European background (p. 216). Trambaiolo’s study points out that, unlike medical practice today in which clinical trials are the standard by which the efficacy of therapies are measured, Tokugawa Japan was characterised by a diversity of standards that differed in respect to lineage, authority, and experience. He concludes that “neither the image of intellectual stasis nor the picture of rapid decline following the confrontation with European medicine can be considered accurate,” reasoning that the Western medical impact did not lead to the rejection of approved therapies found in medical classics of East Asia, but rather to an enrichment on both sides (p. 259). His study thus does not only shed new light on the diversity of medical practices in early modern Japan, but even more importantly, urges us to reconsider the criteria by which medical theory and practice have to be evaluated. Once published, it is sure to have a far reaching impact upon future works on the history of medicine in Tokugawa Japan. Yamawaki Tōyō 山脇東洋. Yōjuin isoku 養寿院医則, 1751. Yoshimasu Tōdō 吉益東洞. Yakuchō 薬徴, 1785. Ikeda Kinkyō 池田錦橋. Tōka ben’yō 痘科弁要, 1821. Nagatomi Dokushōan 永富独嘯庵. Man’yū zakki 漫遊雑記, 1764. Qiu Xi 邱憘. Yin dou lüe 引痘略, 1817. Princeton University. 2014. 282pp. Primary Advisor: Benjamin Elman. Image: Yōjuin isoku 養寿院医則. Waseda University Library.